Angela Sun is a Toronto-based fat East Asian performer, theatre creator, poet, and writer. She is currently a member of the environmental theatre company, Broadleaf Theatre. In her spare time she enjoys reading and writing about art, feminism, pop culture, identity, body image, mental health, and social justice. Ironically, she fell in love with Canadian theatre after seeing a televised production of Kristen Thomson’s I, Claudia on CBC. (She finally saw the remount on stage 5 years later and was over the moon.) You can follow her exploits on her sporadically-updated Twitter @21sungelas. Charlotte Rampling’s staged recitation of Sylvia Plath’s poetry in The Night Dances, a part of the Luminato Festival’s 7 Monologues program, is a kind of performance that I don’t often see anymore. With her arresting stage presence and iconic husky voice, Rampling’s delivery seemed to have come straight out of classic Hollywood or an old British concert hall. 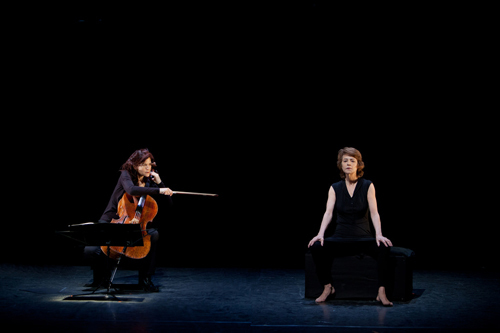 Perfectly complimented by director/cellist Sonia Wieder-Atherton’s vibrant interpretations of select Benjamin Britten movements from Suites No. 2 and 3 for solo cello, The Night Dances – while not flawless – still had me mostly riveted.